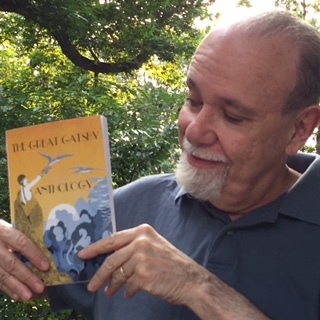 PHOTOGRAPH: Poet David M. Katz with his copy of The Great Gatsby Anthology in New York City’s Riverside Park, lush and green in the summertime, about two blocks from his home, and a few hours by train from Gatsby’s terrain. ABOUT THE AUTHOR: David M. Katz‘s poems have appeared in Poetry, The New Criterion, The Paris Review, PN Review, The Raintown Review, Alabama Literary Review, and Southwest Review. “The Last Page,” his poem featured in The Great Gatsby Anthology, also appears in his most recent book, Stanzas on Oz, Poems 2011-2014. That book also includes a lengthier poem, “Scott’s Last Tape,” which concerns Fitzgerald’s death. His other books of poems are Claims of Home, Poems 1984-2010, and The Warrior in the Forest. As a financial journalist as well as a poet, Katz has long savored Fitzgerald’s ability in Gatsby of being able to catch the economic zeitgeist of the 1920s. 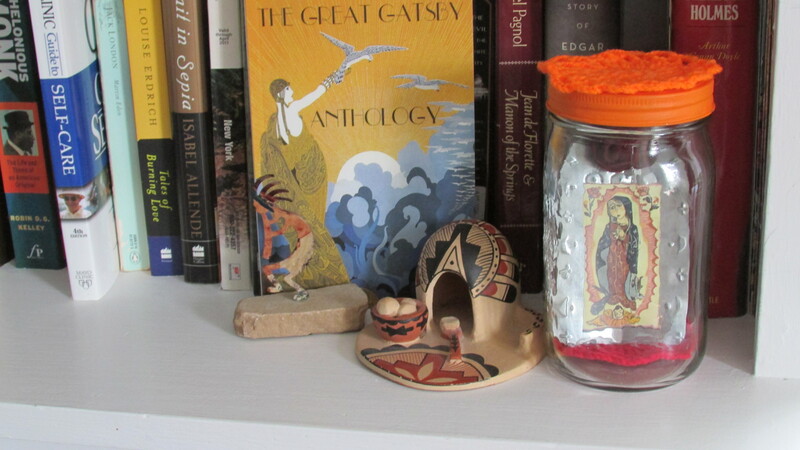 PHOTOGRAPH: Still life with The Great Gatsby Anthology in the home of Catfish McDaris (Milwaukee, Wisconsin, 2015). ABOUT THE AUTHOR: Catfish McDaris’s most infamous chapbook is Prying with Jack Micheline and Charles Bukowski. During the past 25 years, he’s done over 20 chapbooks. An aging New Mexican living near Milwaukee, he has four walls, a ceiling, heat, food, a wife, a daughter, two cats, a typing machine, and a mailbox. His novel Naked Serial Killers in Volkswagens is forthcoming from Weekly Weird Monthly. His archives are held at Marquette University Archives (Catfish McDaris Collection). On March 15, 2014, Silver Birch Press issued a call for submissions for poetry and prose inspired by F. Scott Fitzgerald‘s masterpiece, The Great Gatsby — with a plan to issue the collection in April 2015 to celebrate the 90th anniversary of the novel’s publication. We intend to issue the book soon (but have to push our release date a bit due to factors beyond our control). Thanks to the authors from around the world who contributed their work to the collection. We’ll keep you posted on the spring release date. Stay tuned — and thanks for your patience. repeated through a telescope in the evening. for the first hunt of the season. wanting to go for a stroll. SOURCE: “James Joyce — A Portrait of the Man Who is, at Present, One of the More Significant Figures in Literature” by Djuna Barnes, Vanity Fair (April 1922). 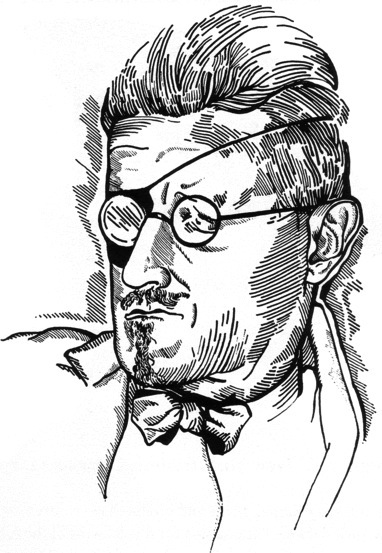 IMAGE: Novelist James Joyce (1882-1941), drawing by Djuna Barnes, Vanity Fair (April 1922). NOTE FROM THE AUTHOR: I found this interview to a celebrity from the past, James Joyce, by mere chance. Though not one of my favourite authors, Joyce has played an important role in my life, accompanying and inspiring me on several occasions. His answers in this interview, published around the publication, on his 40th birthday, of his masterpiece Ulysses, were poetic per se, so I just selected and reordered his words to produce this sketchy self-portrait of the writer. 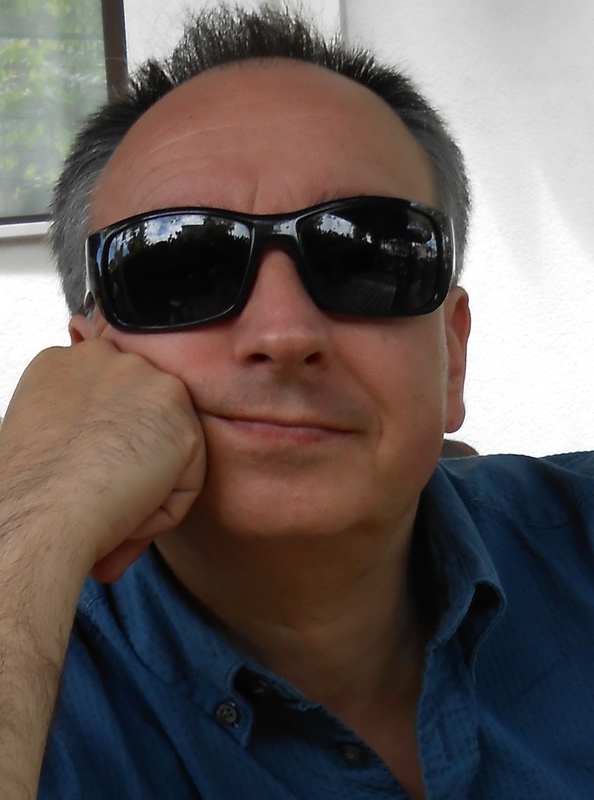 ABOUT THE AUTHOR: Massimo Soranzio writes on the northern Adriatic coast of Italy, about 20 miles from Trieste. He teaches English as a foreign language and English literature in a high school, and has been a journalist, a translator, and a freelance lecturer on Modernist literature and literary translation. 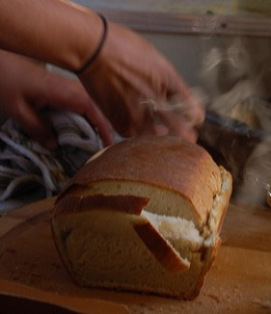 He posts some of his found and constraint-based poetry on his blog, massimosoranzio.tumblr.com. In April 2015, Silver Birch Press will release The Great Gatsby Anthology, a collection of poetry and prose to celebrate the 90th anniversary of the novel’s 1925 publication. We issued our first call for submissions on March 15, 2014, and during the past four months we’ve received an outpouring of submissions from authors around the world — with contributors ranging from up-and-coming writers to those whose work has appeared in The New Yorker and The Paris Review. The Great Gatsby Anthology is coming together — and we’ve decided to feature illustrations by renowned Art Deco artist Erté on the cover and inside the book. Our new cover appears above. The deadline of September 1, 2014 is just six weeks away! If you’d like to submit, the guidelines are included below. WHAT: Poetry, prose, paintings, drawings, photographs, and other work inspired by The Great Gatsby. HOW TO SUBMIT: Please email written entries as MSWord attachments and visual entries as a jpg attachments to silver@silverbirchpress.com along with your name, mailing address, email address, and one-paragraph bio. We also prefer entries that include a note that describes the creative process related to preparing the submission (why you created what you created, the choices you made, etc.). PAYMENT: Each participant will receive a copy of The Great Gatsby Anthology. 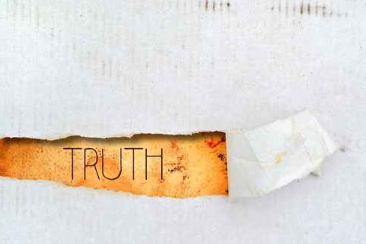 NOTE: If you’ve found a poem in an underlined passage from a book, send it to silver@silverbirchpress.com, along with the publisher, copyright date, and page number, and a one-paragraph bio, and we may feature it on our blog. Marcia Meara started writing novels at age 69 and there’s no slowing her down. 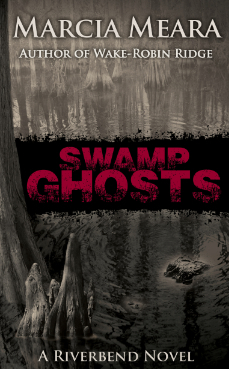 She’s just released her second romantic suspense novel in less than a year — Swamp Ghosts, and the Kindle version is available free today (Tuesday, May 13, 2014). Get your free book at Amazon.com. ABOUT THE NOVEL: Wildlife photographer Gunnar Wolfe looked like the kind of guy every man wanted to be and every woman just plain wanted, and the St. Johns River of central Florida drew him like a magnet. EcoTour boat owner Maggie Devlin knew all the river’s secrets, including the deadliest ones found in the swamps. But neither Maggie nor Gunn was prepared for the danger that would come after them on two legs. On a quest to make history photographing the rarest birds of them all, Gunnar hires the fiery, no-nonsense Maggie to canoe him into the most remote wetland areas in the state. He was unprepared for how much he would enjoy both the trips and Maggie’s company. He soon realizes he wants more than she’s prepared to give, but before he can win her over, they make a grisly discovery that changes everything, and turns the quiet little town of Riverbend upside down. A serial killer is on the prowl among them. Find One Hundred Years of Solitude, a novel by Gabriel Garcia Marquez, at Amazon.com. 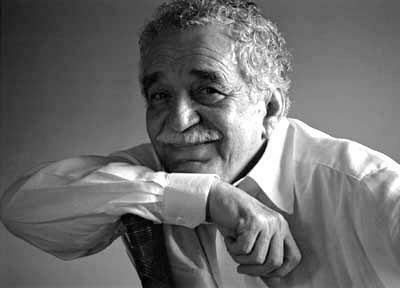 Gabriel Garcia Marquez passed away on Thursday, April 17, 2014 at age 87. We are forever grateful for his brilliance, inspiration, and influence. His novels, including his masterwork One Hundred Years of Solitude, are among the greatest works of art of all time. Thank you for your life and work, Señor Garcia Marquez! You will live on!